Paper cups made with EarthCoating® have received a AAA rating for recyclability from Der Grune Punkt (Green Dot). Paper cups made with EarthCoating® have received a 95% rating for recyclability from Der Grune Punkt (Green Dot). Unlike conventional poly-coated paper cups which end up in waste stream Path 11 (laminated papers), paper cups made with EarthCoating® qualify for waste stream Path 13 (cardboard, paper). Regulation (EC) No 1935/2004 of the European Parliament and of the Council on materials and articles intended to come into contact with food. Compliant with EU Directives 80/590/EEC and 89/109/EEC (OJ L 338, 13.11.2004, p. 4). Applicable migration compliance, per PN-EN ISO 536: 2012, PN-EN 1186-1:2005, PN-EN 1186-9:206, PB-291/GC ed. 1 of 09.02.2015, PN-EN 13130-1:2006, PB-165/HPLC ed. 1 of 06.08.2012, PB-308/GC wyd. 1112 dn. 15.05.2017, Docosone (RT 23.4 min, CAS 629-97-0), Dodecanoic acid, undecyl ester CRT 25.7 min, VSD 3658-44-4. PN-EN 13130-1: 2006 P17, P19, PN-EN 646:2007 (method A-prolonged contact @ 24 hr. PB-253/GC ed. 1 of 03.02.2014, PN-EN ISO 287:2011, CEN/TS 13130-13:2005 IW-28/PNF ed. 1 of 21.09.2015, PN-EN 1541:2003, PN-EN ISO 15320:2011, PB 254 ed. 11 of 24.07.2014, PN-EN 1104:2007, PN-EN 71-3 + A1:2014-12. PB-204/ICP ed. IV of 15.092017, PB-204/ICP ed. IV of 15.09.2017. Commission Regulation (EC) No 2023/2006 of 22 December 2006 on good manufacturing practice for materials and articles intended to come into contact with food (OJ L 384, 29.12.2006, p. 75). Regulation (EC) No 882/2004 of the European Parliament and of the Council of 29 April 2004 on official controls performed to ensure the verification of compliance with feed and food law, animal health and animal welfare rules (OJ L 191, 28.5.2004, p. 1). Compliant to 21 CFR food and drugs, US FDA. This formulation is suitable for contact with all food types, Conditions of use B-H of 21 CFR 176.170(c) Table 2. Compliant to 21 CFR food and drugs, US FDA. This formulation is suitable for contact with all food types except alcoholic, Conditions of use B-H of 21 CFR 176.170 (c) Table 2, with thickness of the food contact article limited to 0.004 inches. EarthCoating® complies with EU 1935/2004 replacing “framework” Directive, Council Directive 89/109/EEC and EC 2023/2006 and EU No 10/2011 on plastic materials and articles intended to come into contact with food. EarthCoating® CaC03 110810 complies with EU 1935/2004 replacing “framework” Directive, Council Directive 89/109/EEC and EC 2023/2006 and EU No 10/2011 on plastic materials and articles intended to come into contact with food. SCC 80148 (EC 40) has a letter of no objection from Health Canada for use in direct contact with all food types at maximum temperatures of 71 C (160 F), File KS14092203,KS14092511/12, X-ref: KP14111401/02/03. DIN EN ISO 14021 "Environmental labels and declarations Self declared environmental claims (Type II environmental labelling)". DIN EN 13430 "Packaging and Requirements for packaging recoverable by material recycling". DIN EN ISO 14021 “Individual Recycleability”. In accordance with recyclability instrumentalized by §21(“ecological design of participation fees”)in the German Packaging Law. Recycling standards in accordance with recommendations of the sworn experts of the Institute cyclos-HTP to initiate monetary incentives for recyclable product development is followed. This is based on 2012 study on the further development of the product responsibility (compare Christiani, J.; Dehoust,G: Analyse und Fortentwicklungder Verwertungsquotenfür Wertstoffe: UBAText40/2012s.42and57) and within the parameters and scope for interpretation is possible by the recycling definition of §3 (25) in the German law of life-cycle management (KrWG). Recycling Certification provided by the Institute of Paper, Science, and Technology “IPST”, Georgia Technological University, Atlanta, Georgia, USA. Compliant with the assessment standard of recyclability according to § 21 Packaging Law. 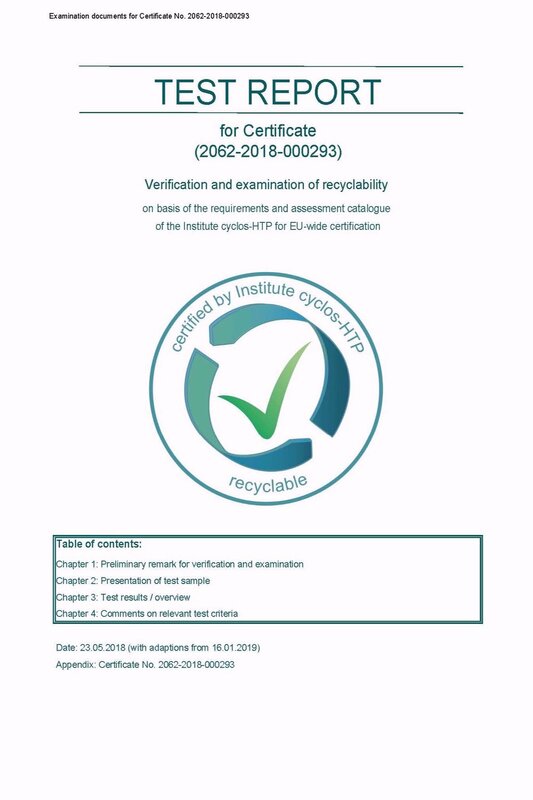 Compliant with the recycling testing disintegration of the sample material in line with the procedures of DIN EN ISO 5263 (2.5 % disintegration consistency, 40 °C, 20 minutes, 60,000 rpm) and recycling testing homogenisation in a standard distributor in compliance with ZM V/6/61 at 0.5 % o.d. stock consistency for approx. 5 minutes. Examination of recyclability furnish in accordance with: Sheet formation in compliance with DIN 54358 but with 60 g o.d./m² handsheets. Recycling testing fractional screening and sheet forming compliant with ZM V/1.4/86 and DIN 5438. These products do not contain any allergens such as peanuts, tree nuts, milk, eggs, wheat gluten, soy, fish, and shellfish. These products do not contain any REACH Substances of Very High Concern (SVHC), EU Regulation No 1907/2006 - REACH SVHC (last updated July 7, 2017-174 substances) as shown on website:http://echa.europa.eu/web/guest/candidate-list-table. These components are not introduced during our manufacturing of these products and the raw materials used are not expected to contain any of these substances. Bisphenol A, Bisphenol S, ITX, Genetically Modified organisms, PFOA, Benzephenone, and mineral oil are not intentionally added and are not expected to be part of the raw materials used to manufacture these products. For access to specific certifications or compliance documentation, please contact us.